This winter is one for the books. 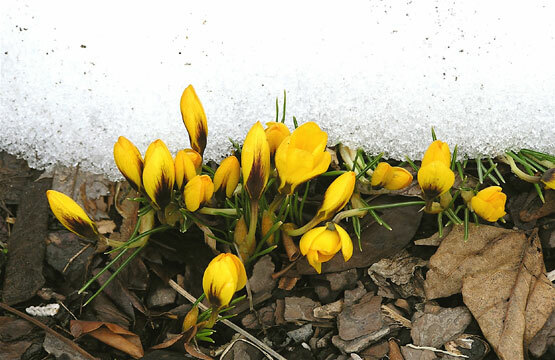 Before January was gone, crocuses (croci?) had sprouted, and we have had actual blooms for over a week already. Before today, February had delivered just 1/2 inch of snow, and we've only accumulated two inches more this morning. Some wild greens (like bitter Garlic Mustard) are already showing. We're grateful, naturally, but the whole thing is decidedly weird. Regular subscribers to our updates newsletter receive these updates from our blog, Just Served, directly -- but there is much more at the blog that isn’t sent automatically. We (regretfully) realize that even readers such as our own do not possess unlimited tolerance. Just Served dishes out more than reasonable people want to chew -- but, if you're feeling particularly unreasonable, and don't want to wait for these newsletters, you can follow us on Facebook, or Twitter. Facebook friends who follow our soi-disant "progress" have already been exposed to a miniscule scrap of doggerel, "A Revelation of Sorts" -- but it can also be found here. Facebook and twitter friends have also been alerted about the book launch party for our latest book, Herbs: A Global History. If you're interested in joining the festivities (and can't think of anything better to do), you can find details here. The Roger Smith Cookbook Conference was delightful, giving us a chance to reconnect with old friends, as well as meet new ones, and put faces on virtual friends we've had for years. If you missed any or all of the panels, videos of the conference are now available online. Meanwhile, we're still stuffing words into our sausage book (for Reaktion's Edible Series). The book is already longer than the contract specifies, and there's still much to be written. Writing, like sausage, is a delicate balancing act between juicy plumpness and just too much fat. Speaking of too much fat, "A Quiet Little Table in the Corner" is an annotated ("annotated" being academic-speak for "yadda yadda yadda... whatevah") directory of our writings -- mostly on other people's sites. Leitesculinaria has reposted several of our articles (the entire list is available, along with several more noteworthy pieces on food history & science. In Italian Food, What's Authentic and Does It Really Even Matter? Writers and Readers United - Living Wages for Lit! Our books, The Resource Guide for Food Writers, The Herbalist in the Kitchen, The Business of Food: Encyclopedia of the Food And Drink Industries, and Human Cuisine are currently available. Advance orders for Herbs: A Global History can also be taken. "The Resource Guide for Food Writers, Update #137" is protected by copyright, and is provided at no cost, for your personal use only. It may not be copied or retransmitted unless this notice remains affixed. Any other form of republication -- unless with the author's prior written permission -- is strictly prohibited.